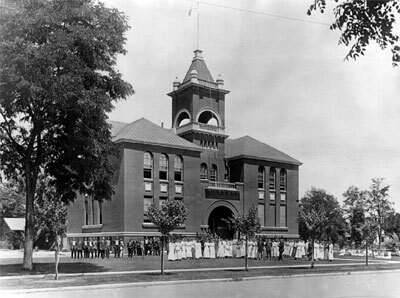 Merced County High School, designed by Louis Starwood Stone in the Richardsonian Romanesque style, was the first building specifically designed and constructed as a high school in Merced County. 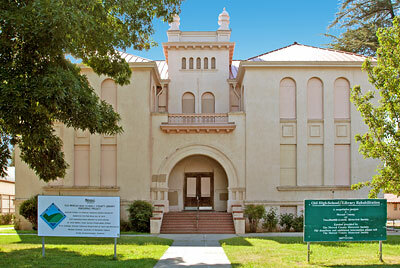 The building is the only example of the Richardsonian Romanesque style in Merced County and is atypical of this architectural style in that it is built of brick and wood rather than rock with a coursed ashlar finish. The old high school is located east of the 1875 courthouse in the city's courthouse square. The original appearance of the building has been altered by the removal of the upper portion of the central wooden tower around 1903, and the addition of stucco over the original brick in 1956. The interior was remodeled for library use circa 1921 and for county offices in 1953. Although integrity has been compromised somewhat, the building still retains its commanding presence in the city's major historic public space, and conveys a strong sense of its original historic character.